Low- and middle-income countries carry a disproportionate burden of the morbidity and mortality from fire-related burns. Improvements in Emergency Medical Services (EMS) can potentially result in faster treatment. The outcome for patients using EMS has not been studied. In this prospective observational study, patients in India who used EMS for critical burn injuries were transported quickly to hospitals, with 88% of patients reaching hospitals within three hours of the original injury. The most critically ill patients cared for by this EMS system were women with non-accidental burns - this cohort had a 90.2% mortality rate. Globally, there were over 33.5 million thermal burn injuries in 2013, resulting in over 1 million years lost to disability, and approximately 237 500 deaths.1 2 The majority of burn deaths, an estimated 90%, occur in low/middle-income countries (LMIC).3 Burns remain a significant public health problem in LMICs, contributing to substantial morbidity and mortality. Emergency medical services (EMS) may play a key role in the public health infrastructure to improve outcomes from burns. EMS could decrease time to care and increase access to care, particularly specialised critical care services. However, there is only a single retrospective study on burns seen by EMS in LMICs9 and no research in India specifically examining the epidemiology of patients with burns seen by EMS. In this study, we sought to characterise the demographics and outcomes of patients using EMS for thermal burns in India. We conducted a prospective observational study of patients using a single EMS system for thermal injuries across five states in India—Andhra Pradesh, Assam, Gujarat, Karnataka and Telangana. EMS was established in these states between 2005 and 2008. A convenience sample of patients were enrolled Monday through Saturday during daytime hours, due to research assistant availability and safety concerns on night shifts. Enrolment occurred over 4 months from May to August 2015. GVK Emergency Management Research Institute (GVK EMRI) operates EMS across 15 states and union territories in India, covering over 750 million people. In these states, individuals have access to free prehospital emergency medical care and ambulance transport via a toll-free phone number, 108. Ambulances are staffed by a driver and a single emergency medical technician (EMT). EMTs are trained to provide wound care and resuscitation, including basic airway management and intravenous fluids. Following initial assessment and treatment, ambulances transport patients to the nearest hospital, unless otherwise requested by the patient or family. As this EMS system is operated by a public–private partnership, most patients are taken to a government hospital. Government hospitals can be generally categorised by the level of care they are built to provide: primary (eg, primary health centres), secondary (eg, community health centres, district hospitals) and tertiary (eg, medical colleges). There is variability even within these divisions, but intensive care capabilities and specialty burn care would only be available at tertiary centres. Follow-up phone calls were completed at 2, 7 and 30 days. Follow-up data collection included patient status, hospital admission and functional status. Per GVK EMRI’s standard procedures, participants provided verbal consent for medical care, transport and follow-up at the time of their enrolment. 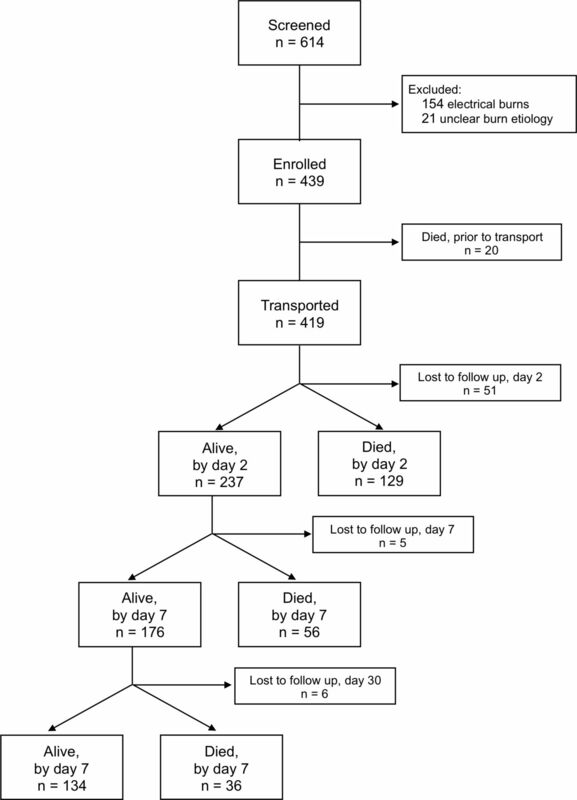 Our primary outcome was mortality at 2, 7 and 30 days. We compared observed mortality with expected mortality using the revised Baux score (age + %TBSA + 17 (if inhalation injury)).11 The revised Baux score has been shown to perform well in another LMIC and a score of 80 translated to a 50% fatality rate (LD50).12 Secondary outcomes included oxygen delivery for suspected inhalation injury, intravenous fluids for hypotension and functional status. Suspected inhalation injury was defined as the presence of facial burns, soot in the nares or mouth, hoarse voice, increased work of breathing, stridor or wheezing. Hypotension was defined as systolic BP <90 mm Hg. In follow-up, we asked patients to rate their functional status, ranging from a complete return to normal activities to being bedridden by pain or injury. For missing data, we used complete case analysis for comparative analysis. We used Χ2 analysis for categorical variables (or Fisher’s exact test when appropriate) and Wilcoxon two-sample test for continuous variables. A p value <0.05 was considered statistically significant. We report ORs and 95% CIs for all modelled predictor variables. For multivariate regression, we model the components of the Baux scores as individual predictors as this model has not been studied in India yet. Further, we model TBSA as a binary variable rather than continuous. Specifically, we chose a cut-off of 10% TBSA, as these are typically transferred to a burn centre in the USA due to increased morbidity and mortality. All data analyses were conducted via SAS Enterprise Guide for Windows, V.7.15 (SAS Institute). From our initial sample of 614 calls, we excluded 154 calls (25.1%) for electrical burns and 21 calls (3.4%) without a clear aetiology. Our final enrolment of 439 individuals represents 11.4% of all calls for burns across these states during the study. We may be underestimating our representativeness of calls for thermal burns specifically because burn type is not identified at dispatchFigure 1. Flow diagram of patient study cohort. The median age was 30 (IQR 22–40), with only 13.4% (n=59) below the age of 18, and 5.7% (n=25) aged 65 or older (table 1). Patients were predominately female (n=288; 65.6%) and from primarily rural and tribal areas (n=318; 72.4%). Certain land in India is designated as protected for tribal peoples. These areas tend to have poorer infrastructure and lower population density than rural areas. Ninety-one percent of calls were made within 1 hour of injury (n=398), with most occurring within 30 min of injury (n=346; 78.8%). Once a call was placed, the median time from call to hospital arrival was 56 min (IQR 35–81 min). Ambulances transported most patients to hospitals within 2 hours of their call (n=399; 94.3%). Transport from rural areas, 66 min (IQR 45–88), was significantly longer than from urban areas, 35 min (IQR 26–57; p<0.01); however, the median distance travelled for rural calls, 17 km (IQR 10–30), was nearly three times farther than for urban calls, 6 km (IQR 3–12). Transport distances and times from tribal areas (20 km (IQR 10–32), 64 min (IQR 39–86)) were similar to rural areas. Patients who died prior to EMT arrival (n=20) were not transported. Most patients who were transported were taken to government hospitals (n=377; 90.0%). Fifty-nine per cent (n=247) were transported to a secondary care centre (eg, community hospital centre or district hospital), while 27.4% (n=115) were transported to a tertiary care centre (eg, medical college). Of the 419 patients who were alive at the time of EMT arrival, 81.6% (n=342) had at least three of the following four key vital signs measured by the EMT: BP, pulse, RR and oxygen saturation (table 2). EMTs reported that for 80.9% (n=110) of patients without a measured BP, a measurement was not taken because patients had sustained burns to both arms. Other reasons included non-functional equipment (8.8%, n=12); the EMT believed it was not indicated (4.4%; n=6); and lack of time (2.9%; n=4). In 91.0% (n=111) of cases where EMTs did not measure an oxygen saturation, the reason was a lack of functional equipment. Almost three-quarters of all patients had evidence of inhalation injury (69.7%; n=306). Of patients with suspected inhalation injury who were alive on EMT arrival, 83.0% (n=240) received oxygen. Further, 95.6% of patients with noted hypoxia (oxygen saturation <90%) were given oxygen by EMTs. Only 25 patients (5.7%) were hypotensive, and 12 of these patients were given intravenous fluids (48.0%). The median EMT estimation of total TBSA burned was 60% (IQR: 30%–90%) (table 3). Younger patients (less than 18 years old) had a significantly lower TBSA burned compared with all other age groups (25%; IQR: 13%–80%; p<0.01). Across ages, women had significantly higher TBSA burned than men, 70% vs 36% (p<0.01). Two hundred and five patients (or their families) reported non-accidental burns (46.7%), most of which were reported to be self-inflicted (97.6%; n=200). The median TBSA of non-accidental burns was significantly greater than accidental burns (80% vs 35%; p<0.01). Comparing women and men, even for accidental burns women had a significantly higher median TBSA (40% vs 25%; p<0.01). Response rates at 2, 7 and 30 days were 88.4%, 87.2% and 85.9%, respectively. Most patients (93.4%; n=342) were admitted for at least one night to a hospital and 16.9% (n=62) reported transfer to a higher level of care at some point. Of patients alive at 30 days, only 11.2% (n=15) reported being bedridden or unable to resume normal activities due to pain. An additional 35.8% (n=48) remained in pain, but felt able to complete their normal activities. Revised Baux scores, by gender and intentionality, of patients using emergency medical services (EMS) across five states in India. TBSA was the strongest predictor of mortality. The unadjusted OR for mortality for burns involving greater than 10% TBSA was 25.1 (95% CI 7.5 to 83.8). The LD50 for TBSA burned was 42%. The number of cases enrolled from each state varied widely, and while included in our multivariate regression, state was not a statistically significant predictor. The strongest predictors of mortality were TBSA greater than 10% (OR 7.9; 95% CI 2.2 to 28.7), inhalation injury (OR 5.5; 95% CI 2.5 to 12.2) and intentionality (OR 4.7; 95% CI 2.5 to 8.8) (table 4). Economic status (OR 2.3; 95% CI 1.0 to 5.1) and female gender (OR 2.2; 95% CI 1.2 to 3.9) were also predictive of mortality. In our study, female gender and non-accidental burns were key drivers of mortality. These factors, in addition to time to care, presence of inhalation injury and TBSA, must be considered when addressing the epidemic of burns in India. Additionally, this study demonstrates that EMS can help by providing critical interventions and rapidly transporting patients to care. Previous studies noted that delays in reaching care were key contributors to poor outcomes.6 13–16 In this study, patients and families sought medical care emergently. Even when using the most conservative estimates for time from injury to EMS activation and time from that call to hospital arrival, we found that 88% of patients reached hospital care within 3 hours of injury. This is a significant improvement from the mean of 4 hours from injury to hospital care previously reported.6 Patients transported by EMS often received stabilisation care prior to hospital arrival: EMTs provided oxygen, fluids, wound care and pain control in the field. Future goals for this EMS organisation include further increasing the delivery rates of pain medication, oxygen and intravenous fluids, which may require additional specialised training in difficult intravenous placement and intraosseous access. The severity and associated mortality of burns seen in this study contrast sharply with that seen in other countries. A systematic review of severe burn injuries in Europe, defined as those requiring hospital admission, found the average TBSA burned ranged from 11% to 24% with a maximum reported mortality of 34%.17 Similarly, in the USA, three-quarters of burns involve less than 10% TBSA, and the average mortality is 5.7%.18 Thus, Indian EMTs are encountering sicker patients with a much higher burn severity—60% median TBSA burned and 64.5% mortality. Additionally, the LD50 in the USA is 65%–70% TBSA, substantially higher than that seen in our study (42%).18 One explanation may be the higher prevalence of inhalation injury, which is not accounted for when looking at TBSA alone. When comparing median revised Baux scores, which includes inhalation injury, 68% had Baux scores greater than 80 (the previously established LD50). In fact, 75% of men with non-accidental burns and 93% of women with non-accidental burns had revised Baux scores greater than 80. Other reasons for this high mortality in India may be health system factors (eg, density of critical care), social determinants of health (eg, family support and integration, socioeconomic status) and patient factors (eg, coping and resiliency in patients with non-accidental burns). This study highlights the role of social determinants of health related to burn outcomes through the associations identified between gender, TBSA burned, mortality and intentionality. The high overall mortality from non-accidental burns is similar to that seen in other studies in India.6 13 19 20 Outside of India, men are more likely to self-immolate3 8; in India, this action is primarily undertaken by women and is associated with a history of domestic violence, harassment by in-laws and/or depression or other mental health issues.14 21 Consequently, even those who initially survive their burns may be isolated from their families and struggling with even deeper depression. 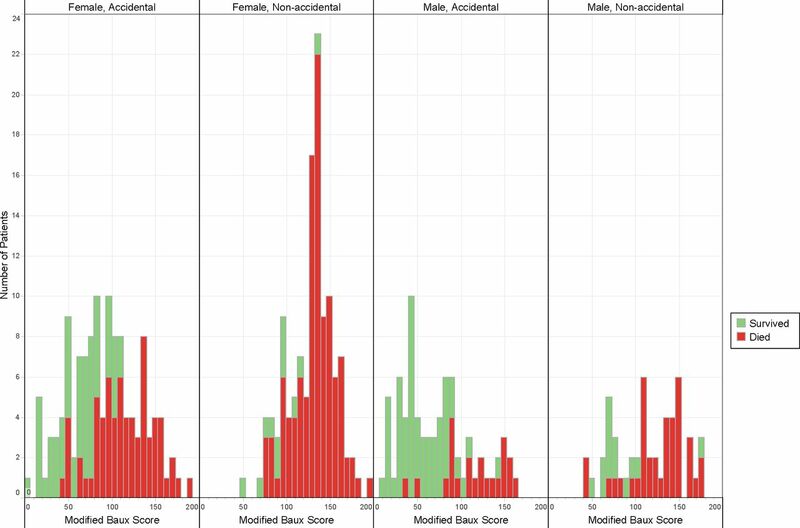 When comparing accidental with non-accidental burns across genders, the TBSA burned, revised Baux scores and observed mortality significantly differed. In accidental burns, more women suffered high TBSA burns, which may be related to the sari, a traditional women’s dress in India, which is loose fitting and long. In non-accidental burns, there is an exponential growth in the TBSA curve above 30% for women, whereas with men, the overall slope is relatively flat. Considering all burns, women are twice as likely to die from their burns, even when adjusting for TBSA involved and intentionality. In addition, severe self-inflicted burns were equally present above and below the poverty level in this study; yet, poorer patients were over twice as likely to die. EMS connects patients to advanced medical care that is essential for the severely burned population. In the USA, transfer of patients to burn centres is guided by American Burn Association’s referral criteria22 (box 1). Most patients in this study would require transfer to burn centres based on these criteria, including the need for ‘special social, emotional, or rehabilitative intervention’ given the high prevalence of non-accidental burns. It is likely that EMTs are already bypassing closer hospitals to transport patients to higher levels of care. Only 3.6% of ambulances transported patients to primary care centres, travelling a median distance of 8.5 km (IQR: 3–12); whereas 58.4% were transported to secondary care centres and 27.2% were transported to tertiary care centres, requiring travel of twice the distance: 17 km (IQR: 8–27) and 10 km (IQR: 5–22), respectively. Developing transport protocols based on local capacity and using available information such as TBSA burned, suspected inhalation injury and vital signs could help direct EMTs to the appropriate initial medical facility, which may not necessarily be a burn centre. Partial-thickness burns of greater than 10% of the total body surface area. Burns that involve the face, hands, feet, genitalia, perineum or major joints. Third-degree burns in any age group. Burn injury in patients with pre-existing medical disorders that could complicate management, prolong recovery or affect mortality. Any patients with burns and concomitant trauma (such as fractures) in which the burn injury poses the greatest risk of morbidity or mortality. In such cases, if the trauma poses the greater immediate risk, the patient’s condition may be stabilised initially in a trauma centre before transfer to a burn centre. Physician judgement will be necessary in such situations and should be in concert with the regional medical control plan and triage protocols. Burn injury in patients who will require special social, emotional or rehabilitative intervention. Finally, our study design was limited by practical constraints allowing only for a convenience sample from daytime EMS calls. While our sample represents over 10% of all calls for burns across five states, we were unable to include late evening or overnight calls. As a result, we may be underestimating burns related to gender-based violence because there may be a higher incidence of this violence after men return home. There are an estimated 700 000 admissions annually for burns in India, but only 800–1000 beds in specialised burn units in the entire country.24 Consequently, this precludes EMS protocols prioritising delivery of patients to centres with specialised burn care capacity. Many patients must travel long distances to reach this specialty care. Therefore, it is equally important that public health investment includes EMS infrastructure that can stabilise patients with critical burns and connect them to definitive care. Swanson and colleagues found that 75% of burn-related deaths occur within the first 72 hours, predominately due to shock, lung injury and anoxic brain injury.15 16 25 The prevention and management of each of these conditions can begin in the prehospital setting with airway management, oxygenation, avoidance of hypothermia and early fluid management. Moreover, with burns as severe as seen in our study, prevention will likely have the greatest impact. The WHO Plan for Burn Prevention and Care, like many other approaches, emphasises prevention in the form of smoke detectors, flame-resistant clothing and changes to cooking practices.26 Unfortunately, the Plan does not mention mental health and gender-based violence support services. In India, the lifetime prevalence of gender-based violence is 37.2% and less than 1% of women will ever reach out for help beyond their family and friends.27 We demonstrate that non-accidental burns carried the highest severity and mortality, and this cohort was primarily young, married women. Consequently, our study emphasises the need to consider the role of mental health and gender-based violence services as integral to the prevention of burns. Patients and families use EMS for patients with severe burns in India. EMS can initiate treatment and rapidly connect patients with critical illness to higher level care. Despite this, mortality remains high, with women disproportionality suffering non-accidental burns and higher mortality. Future efforts must focus on rapid prehospital medical care and critical care development, as well as on a burn prevention strategy that includes mental health and gender-based violence supportive services. Special thanks to Loretta Matheson for her help with statistical review; and to Aruna Gimkala, Royal Uddin Ahmed, Steffy Christian, Roshidul Islam, Chetana Jani, Rupjoy Maibangsa, Hanamesh Nagappa, Divya Patel, Niyati Patel, Om Raj, Srinivas Rao, Marada Lakshmana Rao, Geetanjali Thakur, Hem Prakash Thakur, Isberth Tham and Munirathnamama Venkateshappa for their help with data collection and data quality monitoring. American Burn Association. National Burn Repository Report of Data from 2005-2015, 2015. www.ameriburn.org/2015NBRAnnualReport.pdf. (Accessed 10 Nov 2017).
. India: an analysis of 1368 patients in 1 year. Burns 1993;19:339–44. World Health Organization. Beyond the numbers: reviewing maternal deaths and complications to make pregnancy safer. Br Med Bull 2004;67:27–37.
. Confronting the global burden of burns: A WHO plan and a challenge, 2009.